Majapahit was an Indianized kingdom based in eastern Java from 1293 to around 1500. Its greatest ruler was Hayam Wuruk, whose reign from 1350 to 1389 marked the empire's peak, when it dominated other kingdoms in the southern Malay Peninsula, Borneo, Sumatra, Bali, Kalimantan and eastern Indonesia, and the Philippines. The Majapahit empire was the last of the major Hindu empires of the Malay archipelago and is considered one of the greatest states in Indonesian history. Majapahit society developed a high degree of sophistication in both commercial and artistic activities. Its capital was inhabited by a cosmopolitan population among whom literature and art flourished. It had a thriving cash economy, based on rice cultivation and trade, which supported a wide variety of industries and professions. Around 1527 it succumbed to the Sultanate of Demak. For Indonesians in later centuries, Majapahit became a symbol of past greatness, and has been evoked by numerous political entities, including the Islamic sultanates of Demak, Pajang, and Mataram, various Central Javanese dynasties, the Indonesian National Revival and the Communist Party of Indonesia as a symbol of power and legitimacy. 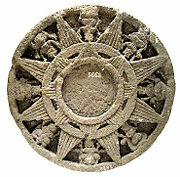 'Surya Majapahit' (The Sun of Majapahit) is the emblem common found in Majapahit ruins. It probably served as the coat of arms of the Majapahit empire. Extent of Majapahit influence based on the Nagarakertagama; the accuracy of such Javanese depictions is disputed. Little physical evidence of Majapahit remains, and its detailed history is not very clear. The main historical sources for the Majapahit Empire are the Pararaton (Book of Kings) written in Kawi language and Nagarakertagama in Old Javanese. Pararaton is mostly about Ken Arok (the founder of Singhasari) but includes a number of shorter narrative fragments about the formation of Majapahit. Nagarakertagama is an old Javanese epic poem written during the Majapahit golden age under the reign of Hayam Wuruk; subsequent events are unclear. References to the kingdom are also found in some inscriptions in Old Javanese, and in Chinese records. The accuracy of all of the Javanese sources is disputed, because they incorporate some non-historical, mythological elements; some scholars, such as C. C. Berg, consider the entire corpus to be intended, not as a record of the past, but a supernatural means by which the future can be determined. However, the basic outline corresponds with Chinese records that could not share this intention, and the list of rulers and description of the nature of the state, in particular, appear to be accurate. The statue of Harihara, the god combination of Shiva and Vishnu. It was the mortuary deified portrayal of Kertarajasa. Originally located at Candi Simping, Blitar, the statue is now preserved at the National Museum of Indonesia. After defeating Srivijaya in Sumatra in 1290, Singhasari became the most powerful kingdom in the area. Kublai Khan, the ruler of the Chinese Yuan Dynasty, challenged Singhasari by sending emissaries demanding tribute, but Kertanegara, the last ruler of Singhasari, refused. In 1293, Kublai Khan sent a massive expedition of one thousand ships to Java. By the time they arrived, Jayakatwang, the Adipati (Duke) of Kediri, a vassal state of Singhasari, had usurped and killed Kertanagara. Raden Wijaya, Kertanegara's son-in-law, after being pardoned by Jayakatwang, through the offices of Madura's regent, Arya Wiraraja, was given the land of Tarik. There he opened the vast timberland and built a new village. When the Mongolian Yuan army sent by Kublai Khan arrived, Wijaya allied himself with them to fight against Jayakatwang. Once Jayakatwang was destroyed, Raden Wijaya launched a surprise attack on his allies and forced them to withdraw from Java. Yuan's army, caught in unfamiliar and hostile territory, withdrew in confusion. They took the last opportunity to catch the monsoon winds and sail home, rather than waiting another six months on a hostile island. 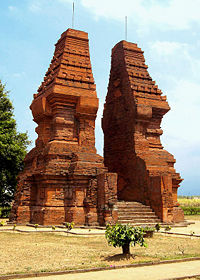 In 1293 C.E., Raden Wijaya founded a stronghold, and named his capital Majapahit, from maja (a fruit name) and pahit (or bitter). He took the formal name of Kertarajasa Jayawarddhana. The new kingdom soon faced challenges. Some of Kertarajasa's most trusted men, including Ranggalawe, Sora, and Nambi rebelled against him, though unsuccessfully. It was suspected that the mahapati (equal with prime minister) Halayudha had conspired to involve them in a rebellion and then overthrow them all, in order to gain the highest position in the government. Following the death of the last rebel, Kuti, Halayudha was captured and jailed for his tricks, and then sentenced to death. Wijaya himself died in 1309 C.E. Wijaya's son and successor, Jayanegara was notorious for being immoral and taking his own step-sisters as wives. He was entitled Kala Gemet, or "weak villain." Jayanegara was murdered by his doctor in 1328 C.E. His stepmother, Gayatri Rajapatni, was supposed to succeed him, but she instead retired from court to become a bhiksuni (female Buddhist monk) in a monastery and appointed her daughter, Tribhuwana Wijayatunggadewi, formally known as Tribhuwannottungadewi Jayawishnuwardhani, to rule on her behalf as the queen of Majapahit. During Tribhuwana’s rule, the Majapahit kingdom grew much larger and became famous in the area. After the death of her mother in 1350 C.E., Tribhuwana was succeeded by her son, Hayam Wuruk. Hayam Wuruk, also known as Rajasanagara, ruled Majapahit from 1350–1389. During this period, Majapahit attained its peak with the support of his Prime Minister, Gajah Mada. Under Gajah Mada's command (1313–1364 C.E. ), Majapahit’s armies conquered more territory. In 1377, a few years after Gajah Mada's death, Majapahit sent a punitive naval attack against Palembang, contributing to the end of the Srivijayan kingdom. Gajah Mada's other renowned general, Adityawarman, was known for his conquest of Minangkabau. In Cantos XIII and XIV of the book Nagarakertagama, several states in Sumatra, Malay Peninsula, Borneo, Sulawesi, Nusa Tenggara islands, Maluku, Papua, and some parts of Philippines islands are said to be under Majapahit’s influence. This would mark the greatest extent of Majapahit empire. The Nagarakertagama, written in 1365, depicts a sophisticated court with refined taste in art and literature, and a complex system of religious rituals. The poet describes Majapahit as the centre of a huge mandala extending from New Guinea and Maluku to Sumatra and Malay Peninsula. Local traditions in many parts of Indonesia retain accounts ]] from the fourteenth century, in more or less legendary form, of Majapahit's power. Majapahit's direct administration did not extend beyond east Java and Bali, but challenges to Majapahit's claim to overlordship of the outer islands drew forceful responses. The nature of the Majapahit empire and its extent is subject to debate. It may have had limited or entirely notional influence over some of the tributary states including Sumatra, the Malay Peninsula, Kalimantan, and eastern Indonesia, as claimed in the Nagarakertagama. Geographical and economic constraints suggest that rather than being organized under a centralized authority, the outer states were most likely to have been connected mainly by trade, which was probably a royal monopoly. Majahapit also claimed relationships with Champa, Cambodia, Siam, southern Burma, and Vietnam, and even sent missions to China. Although the Majapahit rulers extended their power over other islands and destroyed neighboring kingdoms, they seem to have concentrated on controlling and gaining a larger share of the commercial trade that passed through the archipelago. About the time Majapahit was founded, Muslim traders and proselytizers began entering the area. Following Hayam Wuruk's death in 1389, Majapahit power entered a period of decline due to conflicts over succession. Hayam Wuruk was succeeded by the crown princess Kusumawardhani, who married a relative, Prince Wikramawardhana. Hayam Wuruk also had a son from a previous marriage, Crown Prince Wirabhumi, who also claimed the throne. A civil war, called Paregreg, is thought to have occurred from 1405 to 1406, in which Wikramawardhana was victorious and Wirabhumi was caught and decapitated. Wikramawardhana ruled until 1426 and was succeeded by his daughter Suhita, who ruled from 1426 to 1447. 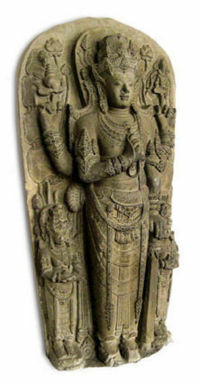 She was the second child of Wikramawarddhana by a concubine who was the daughter of Wirabhumi. In 1447, Suhita died and was succeeded by her brother Kertawijaya, who ruled until 1451. Kertawijaya died, Bhre Pamotan, formally named Rajasawardhana, at Kahuripan until his death in 1453. A three-year period without a king seems to have ensued, possibly as the result of a succession crisis. Girisawardhana, son of Kertawijaya, came to power in 1456. He died in 1466 and was succeeded by Singhawikramawardhana. In 1468, Prince Kertabhumi rebelled against Singhawikramawardhana, promoting himself as king of Majapahit. Singhawikramawardhana moved the Kingdom’s capital to Daha and continued his rule until he was succeeded by his son Ranawijaya in 1474. In 1478, Ranawijaya defeated Kertabhumi and reunited Majapahit as one Kingdom. Ranawijaya ruled from 1474 to 1519, with the formal name Girindrawardhana. These family conflicts and the growing power of the north-coastal kingdoms in Java gradually brought about the decline of Majapahit, which found itself unable to control the rising power of the Sultanate of Malacca. Dates for the end of the Majapahit Empire range from 1478 (that is, 1400 Saka, the ends of centuries being considered a time when changes of dynasty or courts normally ended) to 1527. The year is marked among Javanese today with candra sengkala "sirna ilang kertaning bumi" (the wealth of earth disappeared and diminished) (sirna = 0, ilang = 0, kerta = 4, bumi = 1). After a series of battles with the Sultanate of Demak, the last remaining noblemen of Majapahit were forced to withdraw eastward to Kediri; it is unclear whether they were still under the rule of the Majapahit dynasty. This small state was finally extinguished at the hands of the Demak in 1527. A large number of courtiers, artisans, priests, and members of the royalty moved east to the island of Bali; however, the crown and the seat of government moved to Demak under the leadership of Pengeran, later Sultan Fatah. Wringin Lawang, the 5.5 meter tall red brick split gate. Located at Jatipasar, Trowulan, Mojokerto, East Java. Believed to be the entrance of an important compound in Majapahit capital. Of all the buildings, none lack pillars, bearing fine carvings and colored" [Within the wall compounds] "there were elegant pavilions roofed with aren fiber, like the scene in a painting… The petals of the katangga were sprinkled over the roofs for they had fallen in the wind. The roofs were like maidens with flowers arranged in their hair, delighting those who saw them (description of the Majapahit capital from the Old Javanese epic poem Nagarakertagama). The main event of the administrative calendar took place on the first day of the month of Caitra (March-April) when representatives from all territories paying tax or tribute to Majapahit came to the capital to pay court. Majapahit's territories were roughly divided into three types: The palace and its vicinity; the areas of east Java and Bali which were directly administrated by officials appointed by the king; and the outer dependencies which enjoyed substantial internal autonomy. The capital (Trowulan) was grand and known for its great annual festivities. Buddhism, Shaivism, and Vaishnavism were all practiced, and the king was regarded as the incarnation of the three. The Nagarakertagama does not mention Islam, but there were certainly Muslim courtiers by this time. Although brick had been used in the candi of Indonesia's classical age, it was Majapahit architects of the fourteenth and fifteenth centuries who mastered its use. Their temples made use of a vine sap and palm sugar mortar, and had a strong geometric quality. Details from the Nagarakertagama of the posthumous sraddha ceremony, performed to honor the soul of a deceased. The description is specifically of the ceremony for the Queen Grandmother Gayatri's soul, the Rajapatni, who had died twelve years earlier. In the Canto 63, stanza 4, Prapanca narrates the busy preparation of the ceremony by the court artisans. During the ceremony, lion thrones were erected, and priests placed a flower effigy (puspa) symbolizing the soul of the Queen Grandmother. The descent of the soul to earth and its final placement in the puspa were narrated in Canto 64, stanza 5.: All the multitude of the artisans there, making plaited bamboo-work, fashioning the sthana singha (lion-throne) in the wanguntur (main court-yard), setting aside those who carved wawans (carriers) for food, bukubukuran (all kinds of tower-like structures) and figures and things of that kind. Took part also the smiths of dadaps (embossed coverings) of gold and silver, all of them bestirring themselves the more in their respective customary occupations (Canto 63, stanza 4). At the waxing moon, on the twelfth night, they invited there that swah (soul), sutra (sacred texts) recital was performed and homa (fire offering) worship, on the other hand also parίshrama (amphidromy); they were (only considered) complete at the arrival of the swah (soul) again (on earth). The honored holy puspa (flower effigy) was worked on with yoga (concentration); in the night was performed the eminent pratistha (placing) ceremony (Canto 64, stanza 5). 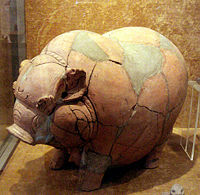 Majapahit Terracotta Piggy Bank, 14-15 century AD Trowulan, East Java. (Collection of National Museum of Indonesia, Jakarta). In the Majaphit kingdom, taxes and fines were paid in cash. Java's economy had bean at least partly monetized since the late eighth century, with the use of gold and silver coins. In about the year 1300, during the reign of Majapahit's first king, an important change took place: The indigenous coinage was completely replaced by imported Chinese copper coins. The reason for this is not given in any source, but most scholars assume it was due to the increasing complexity of Javanese economy and a desire for a currency system that used much smaller denominations suitable for everyday market transactions. This was a role for which gold and silver are not well suited. Some idea of scale of the internal economy can be gathered from scattered data in inscriptions. The Canggu inscriptions dated 1358 mention 78 ferry crossings in the country (mandala Java). Majapahit inscriptions mention a large number of occupational specialties, ranging from gold and silver smiths to drink vendors and butchers. Although many of these occupations had existed in earlier times, the proportion of the population earning an income from non-agrarian pursuits seems to have become even greater during the Majapahit era. The prosperity of Majapahit was probably due to two factors. The northeast lowlands of Java were suitable for rice cultivation, and during Majapahit's prime numerous irrigation projects were undertaken, some with government assistance. Also, Majapahit's ports on the north coast were probably significant stations along the route to obtain the spices of Maluku, and as the spices passed through Java they would have provided an important source of income for Majapahit. Majapahit was the largest empire ever to form in Southeast Asia. Although its political power beyond the core area in east Java was diffuse, constituting mainly ceremonial recognition of suzerainty, Majapahit society developed a high degree of sophistication in both commercial and artistic activities. Its capital was inhabited by a cosmopolitan population among whom literature and art flourished. For Indonesians in later centuries, Majapahit became a symbol of past greatness. The Islamic sultanates of Demak, Pajang, and Mataram sought to establish their legitimacy in relation to the Majapahit. The Demak claimed a line of succession through Kertabumi, as its founder, Raden Patah, was said in court chronicles be the son of Kertabumi with Putri Cina, a Chinese princess, who had been sent away before her son was born. Sultan Agung's conquest of Wirasaba in 1615, was led by the sultan himself, and may have merited such importance because it was the location of the Majapahit capital. Central Javanese palaces have traditions and silsilah that attempt to prove links back to the Majapahit royal lines, usually in the form of a grave as a vital link; in Java, where legitimacy is enhanced by such a connection. Bali in particular was heavily influenced by Majapahit and they consider themselves to be the true heirs of the kingdom. Modern Indonesian nationalists, including those of the early twentieth century Indonesian National Revival, have invoked the Majapahit Empire. The memory of its greatness remains in Indonesia, and is sometimes seen as a precedent for the current political boundaries of the Republic. Many of modern Indonesian national symbols derive from Majapahit Hindu-Buddhist elements. The Indonesian national flag "Sang Merah Putih" ("Red and White") or sometimes called "Dwiwarna" ("The bicolor" ), is derived from Majapahit royal colors. The Indonesian Navy flag of red and white stripes also has a Majapahit origin. The Indonesian coat of arms, Garuda Pancasila, derives from Javanese Hindu elements. The statue and relief of Garuda, a depiction of king Airlangga as an incarnation of Vishnu riding Garuda, has been found in many temples in Java such as Prambanan from the ancient Mataram era, and Panataran (also Sukuh) temple dating from Majapahit era. In its propaganda from the 1920s, the Communist Party of Indonesia presented its vision of a classless society as a reincarnation of a romanticized Majapahit.It was invoked by Sukarno for nation building and by the New Order as an expression of state expansion and consolidation. Like Majapahit, the modern state of Indonesia covers a vast territory and is politically centered on Java. Majapahit had a momentous and lasting influence on Indonesian architecture. The description of the architecture of the capital's pavilions (pendopo) in the Nagarakertagama invokes the Javanese Kraton and also the Balinese temples and compounds of today. Palapa, the series of communication satellites owned by Telkom, an Indonesian telecommunication company, is named "Sumpah Palapa," after the famous oath taken by Gajah Mada. Gajah Mada swore that he would not taste any spice, until he had succeeded in unifying Nusantara (the Indonesian archipelago). This ancient oath of unification signifies that the Palapa satellite is the modern means of unifying the Indonesian archipelago by way of telecommunication. The name was chosen by president Suharto, and the program was started in February 1975. Genealogical diagram of Majapahit Royal Family. Rulers are highlithed and completed with period of reign. Celebrated as "the golden era of the archipelago," the Majapahit empire has and still continues to inspired many writers and artists to create works based on, or set in the Majapahit era. These include Sandyakalaning Majapahit, a 1933 historical romance written by Sanusi Pane; Panji Koming (since 1979), a weekly comic strip by Dwi Koendoro published in Sunday edition of Kompas, which uses characters from the Majapahit empire to satirize modern Indonesian society; Saur Sepuh (1987-1991), a radio drama and film by Niki Kosasih; Tutur Tinular, a martial arts radio epic set in the Majapahit era; Wali Songo, a film about nine muslim saints ("wali") spreading Islam to Java near the end of Majapahit era; Gajah Mada, a fictionalized biography by Langit Kresna Hariadi; and numerous other books and films. ↑ Rakawi Prapantja, Java in the 14th Century, A Study in Cultural History: The Negara-Kertagama by Pakawi Parakanca of Majapahit, 1365 C.E. (The Hague: Martinus Nijhoff, 1962). ↑ 2.0 2.1 2.2 2.3 2.4 2.5 Ricklefs (1991), 19. ↑ D.G.E. Hall, Problems of Indonesian Historiography, Pacific Affairs 38 (3/4): 353—359. ↑ Jean Gelman Taylor, Indonesia: Peoples and Histories (London: Yale University Press, 2003, ISBN 0-300-10518-5). ↑ 5.0 5.1 5.2 5.3 5.4 Ricklefs (1991), 18. ↑ A.H. Johns, The Role of Structural Organisation and Myth in Javanese Historiography, The Journal of Asian Studies 24 (1): 91–99. ↑ C. C. Berg, Het rijk van de vijfvoudige Buddha (Verhandelingen der Koninklijke Nederlandse Akademie van Wetenschappen, Afd. Letterkunde, vol. 69, no. 1) (Ansterdam: N.V. Noord-Hollandsche Uitgevers Maatschappij, 1962). ↑ Slamet Muljana, Menuju Puncak Kemegahan (LKIS, 2005). ↑ Didier Millet, Indonesian Heritage Series: Ancient History (Singapore: Archipelago Press, 2003, ISBN 981-3018-26-7). ↑ Robert Cribb, Historical Atlas of Indonesia (University of Hawai'i Press, 2000). ↑ 13.0 13.1 Ricklefs, 36-37. ↑ 15.0 15.1 P. Schoppert, S. Damais, Java Style (Paris: Periplus Editions, 1997, ISBN 962-593-232-1). ↑ 18.0 18.1 18.2 18.3 Didier Millet, Indonesian Heritage Series: Ancient History (Singapore: Archipelago Press, 2003, ISBN 981-3018-26-7). ↑ Theodore Friend, Indonesian Destinies (Cambridge: Belknap Press, Harvard University Press, ISBN 0-674-01137-6). ↑ Nigel Bullough, Historic East Java: Remains in Stone (Jakarta: ADLine Communications, 1995). Mason, Colin. 2000. A Short History of Asia Stone Age to 2000 C.E.. New York: St. Martin's Press. ISBN 9780312230593. Muljana, Slamet. 1976. A Story of Majapahit. Singapore: Singapore University Press. Pameran Kemegahan Majapahit. 2006. Majapahit Trowulan. Jakarta: Indonesian Heritage Society. ISBN 9789799563460. Ricklefs, M. C., and M. C. Ricklefs. 2001. A History of Modern Indonesia Since c.1200. Basingstoke: Palgrave. ISBN 9780333800997. Taylor, Jean Gelman. 2003. Indonesia Peoples and Histories. New Haven: Yale University Press. ISBN 9780300097092. A Short History of Majapahit.